My thoughts: A POCKETFUL OF HOPE FOR MOTHERS is a collection of Bible verses, quotes, and essays about mothers compiled by Robin Jones Gunn. This hardcover giftbook is sure to be cherished by all moms-to-be, new moms, or young moms. Maybe even some older moms would love it, although it is geared more toward the younger set. The artwork is gorgeous, and I absolutely love the collection of verses and quotes. The essays were well-written and beautiful and are so true and perfect for young mothers. This would be a lovely mother's day gift for your favorite young mom or mom-to-be. It would also be a great baby shower gift. Beautiful, really. 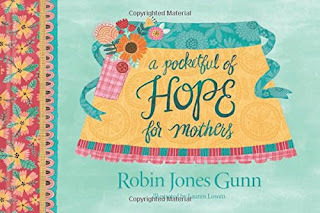 I like the cover of this gift book for mothers. I know several new mothers that may just need this to brighten their days.